Precautions: 1. Please use the standard battery cables we sent, or a full power output may not be guaranteed. And the spare fuses in the package are just used when the original ones are burned by accident. 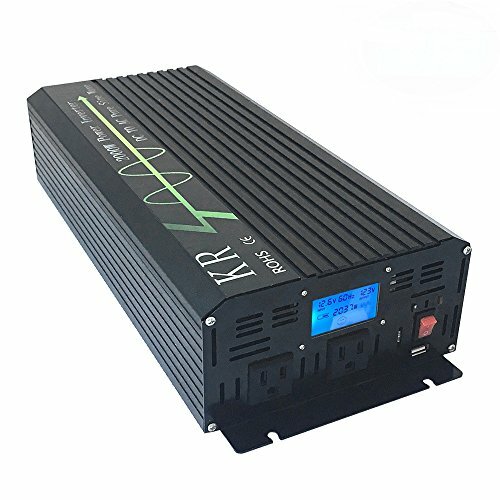 2000W continuous 4000W peak true pure sine wave solar power inverter, as good as grid power, power backup for home power supply. Transfer 12VDC to 120VAC, 60Hz frequency, dual US outlets. Intelligent temperature control cooling fan. Earth connection for both PCB board and output. Digital LCD display. Free standard battery cables ( 55cm length ) and spare fuse for replacement. If you have any questions about this product by KRXNY, contact us by completing and submitting the form below. If you are looking for a specif part number, please include it with your message.